By definition, metamorphosis indicates an alteration is physical build and structure, commonly associated with insects. As a great novel of the 20th Century, written by a phenomenal thinker for his time, Franz Kafka, Metamorphosis digs deep introspection, unknowingly looking for meaning or something to hang on to. This is the word which rung in conversation and thought, and has come to symbolize a new line of thought, and design inspiration for Boca do Lobo. Insects can be repulsive and can make you think of how different and unique life is by itself. As a subjective concept, beauty can be found in the strangest things, but is guaranteed a place in what is known as luxury. Putting aesthetic standards and the meaning of beauty to test, the Metamorphosis series seeks to provoke a questioning within the evolutionary context. 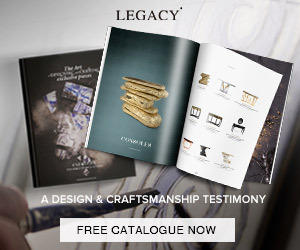 The current three-piece set, takes Boca do Lobo’s core selection of materials, wood and brass which undergo a series of new treatment processes, to complete such a challenging design. The Diamond Metamorphosis Sideboard is built from a wood composit, which features hand-carved details filled with a hand hammered brass sheet. Its interior is glided in gold leaf, while it’s exterior takes a lacquer coat. The sideboard’s base takes a textured brass plate, while it’s detailed buffet surface see’s the individual placing of a series of insects, cast from brass, and treated with a nickel coat. 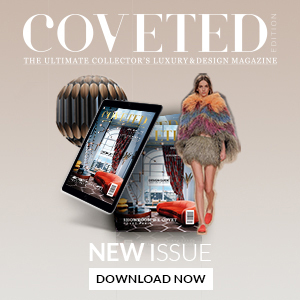 Get some more exclusive and limited edition buffets and cabinets by downloading this FREE EBOOK, with a curated selection of the best of cabinet design has to offer.